In 2015, the Washington State Legislature mandated that the Department of Natural Resources, Washington Geological Survey collect, analyze, and publicly distribute detailed information about our state’s geology using the best available technology – lidar. 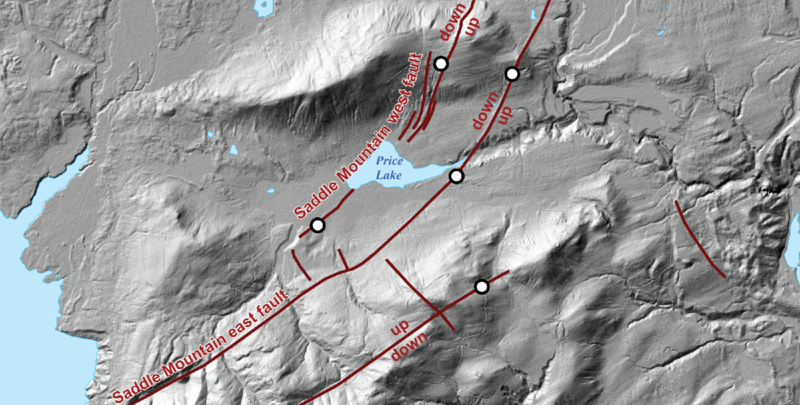 The main focus of this new push for lidar collection is to map landslides, but there are innumerable additional benefits and applications of this data both inside and outside of the field of geology. The Survey has set up a new lidar program and has begun collecting, inventorying, processing, and storing existing lidar data. New airborne lidar collection is underway, starting with areas at higher risk for landslides that do not already have high-quality lidar data. The goal of the project is to gather high-quality lidar data for the whole state. Roughly 25 to 35% of the state has been flown, but the landscape changes over time, as does technology. Just as importantly, much of the state only has poor-quality lidar coverage that is of limited use to those relying on the information. These lidar collection flights were either scheduled during seasons where leaves are still on deciduous trees or with lower point-density specifications. Many areas that have already been collected will be scanned again at better resolution in order to be of use in landslide hazard assessments. 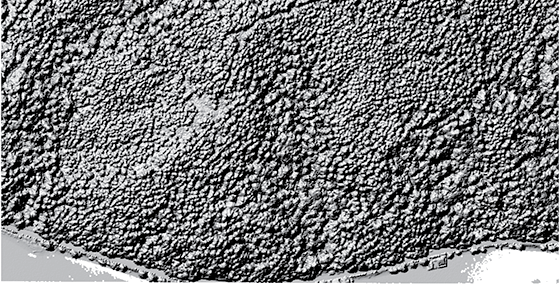 Use your mouse to hover over the photo to compare the detail in topography generated from 2-meter lidar versus a standard 10-meter DEM. Planned lidar project areas by the Survey. Click on a button to see information about the projects. The highest priority areas are where landslides are frequent and population density is high, or there is critical infrastructure. 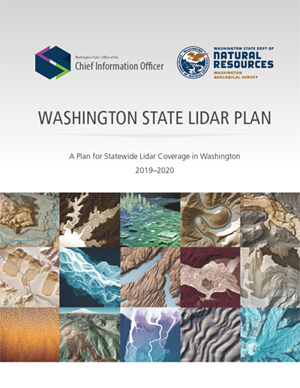 The Washington State Lidar Plan provides an overview of lidar in Washington State for potential users of lidar data, such as cities, counties, state agencies, federal agencies, and tribes. The report includes an overview of past data collection efforts, a list of stakeholders, a summary of the value of lidar data, and a strategy for completing statewide lidar coverage. The plan includes priority areas and estimated funding. This is the State’s first formal statewide lidar plan, and it will be updated annually. The plan represents a collaboration between the Department of Natural Resources (DNR) and the Office of the Chief Information Officer (OCIO). Contact Abby Gleason (DNR) or Joanne Markert (OCIO) for more details about the State Lidar Plan. 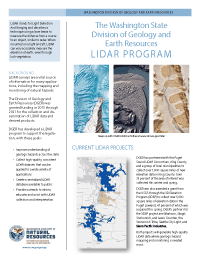 We have developed a lidar program with the goal of increasing understanding of geologic hazards, collection of consistent, high-quality lidar data, the creation of a lidar portal for public use, and outreach and education with the public and stakeholders. New lidar will be flown every year for the next three years. If your organization would like to partner with the Department of Natural Resources to fly lidar in areas not currently planned, please contact the Lidar Manager Abby Gleason for more details. 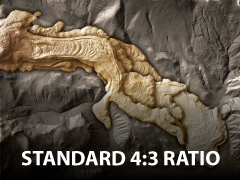 The Washington Department of Natural Resources Lidar portal currently offers the ability to download Digital Elevation Models (DEMs), hillshade derivatives, and point cloud data for about a third of DNR’s data holdings. We will continuously add to the site as we receive new datasets and make improvements, so check back often for updates! 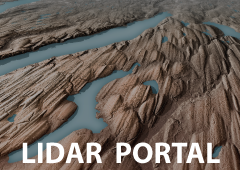 Lidar data can also be freely downloaded on the Puget Sound Lidar Consortium website. Other sites with Washington State lidar data include the Open Topography Interactive Map, the USGS National Map Viewer, and the NOAA Data Access Viewer. Lidar stands for LIght Detection And Ranging and the physics behind it are pretty simple. By pointing a laser at a surface at closely spaced intervals and measuring the time it takes for light to return to the source, very accurate three-dimensional information can be obtained with sufficient measurments. Billions of these measurements can yield an extremely detailed three-dimensional rendering of the terrain. Informative video of how lidar works, by the National Ecological Observatory Network (NEON). The instrument that collects the data is made up of a laser, scanner, and a GPS receiver. For ground scanning operations, the laser is typically a near-infrared laser. For water based surveys, a green wavelength laser is typically used. Green lasers are visible to the human eye and will penetrate shallow water, making them ideal for coastal surveys. Near-infrared lasers are invisible and harmless to the eye, but cannot penetrate below the surface of water. Unlike green lasers, water absorbs the energy from the near-infrared laser rather than reflecting it. The instrument is mounted to a light aircraft, car, or static survey platform where an eye-safe laser measures objects with an accuracy of about 1 inch. Scanning over 100,000 points a second, the laser reflects off trees, buildings, streets, shrubs, people, and the ground. Flight paths are planned so that there is over 100% overlap of individual flight segments, such that a) every square meter of ground is covered twice and b) the number of points per square meter meets project specifications. A computer sorts the points and separates them for different uses, though it requires a specialist to process and interpret the lidar data. The light is measured and calibrated using GPS, survey stations, and computer processing. Points representing the measurement locations are then created with a latitude, longitude, and height value. Millions to billions of points make up one dataset and are called point clouds. These points are sorted (classified) into different groupings according to what the laser hit. The main groups are first and last returns. First returns are the beams that reach the device first. This means they generally reflect the tops of vegetation, unless the ground is bare. The last return can be the ground surface, or it can return from low-lying vegetation. Dense forests, especially when leaves are on the trees, are difficult for the laser to fully penetrate. Using fancy computer algorithms, the returns are usually categorized into tree top, bare earth, buildings, vegetation, and water. Lidar point clouds are used to create derivative products. Commonly, models show the surface of the earth without vegetation. 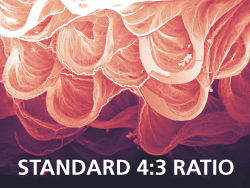 Others elevation models depict information such as: forest canopy, slope angle, slope direction, stream flow, elevation contours, 3D models of buildings, people, and more. Click here to view the story map in full screen mode. Aerial imagery of the west side of Van Zandt 'dike', along the Nooksack River in Whatcom County. 10m DEM hillshade of the same area. The subdued and coarse imagery does not show this area's story. Lidar hillshade of the same area reveals a massive landslide with large runout that constricts flow of the Nooksack River to the west side of the valley. Lidar elevation data provides further detail. Aerial image of a steep slope near the northern edge of Mount Rainier National Park. 10m DEM hillshade of the same area. Lidar imagery of the same area reveals landslide. Aerial image of a section of the Sauk River valley near Darrington. Lidar-based relative elevation model image of the same area, which brings out former channel meanders within the floodplain. Aerial image of the Carbon Glacier on Mount Rainier. 10m DEM hillshade of the Carbon Glacier. Colorized lidar hillshade shows detail of crevasses in the glacier. Aerial imagery of Hood Canal and Case Inlet along the boundaries of Kitsap, Pierce, and Mason Counties. 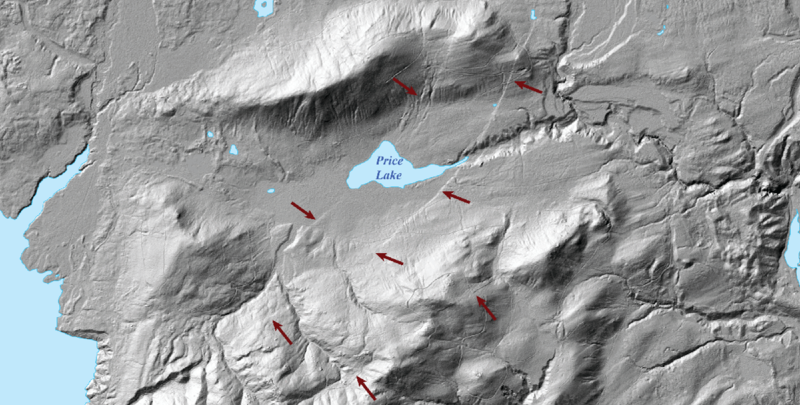 Lidar imagery of the same area reveals dramatic fluted topography left behind by the last ice age. 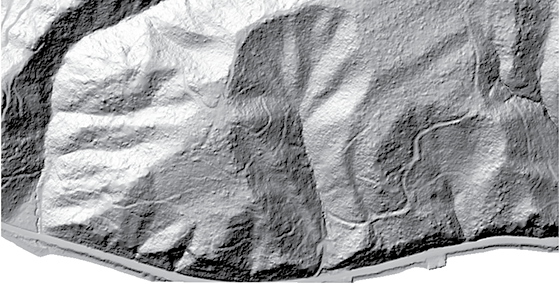 Use your mouse to hover over the photo to see lidar reveal hidden and enigmatic "Manastash Mounds" near Yakima. Lidar is widely used for many different applications. Some (but by no means all) of those uses are described below. In geology, bare earth models allow closer study of geomorphology, which is the study of the origin of the topography of the earth. Floods, faults, landslides, erosion, and glaciers leave their mark on the landscape, and while these marks can be hidden by dense vegetation, they can't hide from lidar. Many, but not all, of the applications specific to geology are described below. Lidar is also used in natural resources conservation, water supply and quality assessments, river and stream resource management, and mining resource management. Before the use of lidar became widespread, geologists used aerial photographs, topographic maps, and field surveys to catalog landslides. This method is problematic in Washington because of the density of vegetation that often either obscures features or makes field checking difficult. Landslides often have characteristic topography that is obvious once it's visible. Slump blocks, hummocky topography, scarps, sag ponds can all identify a landslide. With lidar, a geologist can go over large tracts of land to find landslides quickly and more accurately than using aerial photographs alone. Hover your mouse over the image to compare aerial imagery to lidar imagery of a large landslide south of Kendall on the east side of Sumas Mountain. Signs of young faults include sag pongs, offset stream beds, and linear scarps. Lidar gives geologists the ability to find these features no matter what the ground cover is like or if the feature is partly eroded. Use your mouse to hover over the photo to see imagery of fault scarps in lidar. These faults are located just east of Lake Cushman, on the southeast Olympic Peninsula, and have created a sag pond, Price Lake. White circles represent areas where trenching has been conducted to characterize and establish timing of fault movement. Lidar allows geologists to find subtle geologic features that might be otherwise missed. Features such as landslides, faults, river terraces, drumlins, glacial outwash channels, alluvial fans, eskers, and fluting are readily apparent when high-quality lidar imagery is available. Landform analysis can be used to extrapolate field findings to correlate geologic units across different areas. Lidar is useful for many hydrologic applications. Floodplains can be mapped in detail. Models can be created to show where areas are at risk to flooding. Subtle river features, such as abandoned channels, ditches, terraces, and levees can be identified. This allows land managers and decision-makers to manage flood zones, preserve the natural functions of floodplains, and better craft emergency response procedures. Elevation model from Information Circular 118, showing features of the Chehalis River floodplain derived from lidar elevation data. Tsunamis are a potential threat in coastal regions. Lidar gives scientists an accurate surface representation of the ground, allowing models to more accurately predict where a tsunami could inundate an area. This modeling can give residents the ability to plan where to evacuate during an emergency. Lidar is used to monitor the growth or decline of glaciers. Repeated monitoring over the same area documents the effects of climate change or geologic activity. 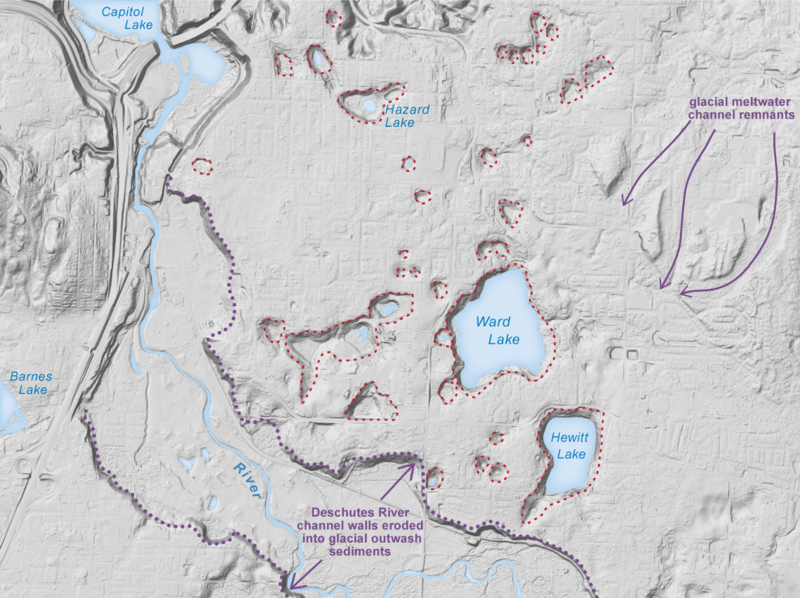 Additonally, geologists can use lidar to discern the glacial history from the last ice age. Kettles are depressions resulting from glacial ice left behind as the glacier retreated. The blocks of ice were buried by sand and gravel from glacial streams and subsequently melted in place. These kettles are part of the Budd Inlet Kettle Train, just south of Olympia. Lidar can be used to monitor coastal regions. Repeated runs of lidar can be used to monitor the effects of currents and storms that migrate large amounts of sediment very quickly. Repeated measurement over time can be used to monitor volcanic activity. Mount St. Helens is an example of this, as lidar was used to document dome building at the summit between 2002 and 2004. Dome building at the summit of Mount St. Helens between 2002 and November of 2004. Lidar can also be used to map lahar hazards. Accurate models of topography downstream from volcanoes can be used to predict lahar travel paths, pinpoint danger zones, and identify safe evacuation routes. Using bare earth and tree canopy models created from lidar, it's possible to look at large areas of forests in great detail. These and other models can be used to estimate volume, density, mass, leaf area, canopy heights, and growth rate. These data are used to plan logging, estimate yield, map biodiversity, locate wildlife habitat, and plan conservation efforts. Hover your mouse over the image to view the bare earth hillshade beneath the tree canopy. 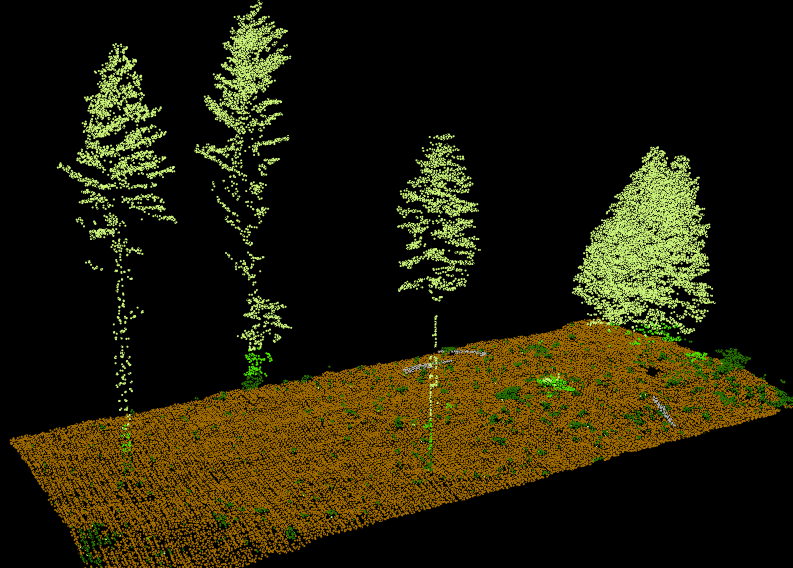 Individual tree crowns, tree height, and density can be analyzed with lidar. 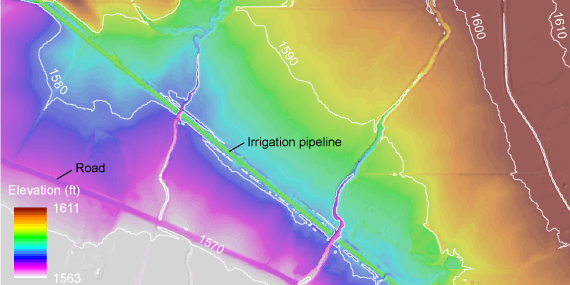 Analysis of lidar elevation data can produce detailed models of stream flow in watersheds. Lidar can also be used to render physical objects graphically. Cities, individual buildings, cars, and other objects can be modeled in a 3D environment. These models can then be used to make video games, recreate the scene of an accident or crime, help plan building restoration, and more. Lidar can be used to map out all of the details of a building inside and out. This is useful if, for example, someone wants to recreate an entire stadium for use in a video game. A stationary lidar survey platform can model the whole building much faster and more acurately than an artist. Lidar is now being used in autonomous navigation. The systems use lasers to measure distance and speed for all surrounding objects, allowing the car's computer to map the its surroundings in real time. This allows for adaptive speed relative to traffic in front of the vehicle, adaptive suspension, and automatic parking. Similarly, aerial robots can use lidar to map the terrain below them. This allows them to safely avoid obstacles and land by measuring the robot's speed and position relative to its surroundings. The software can use the lidar data to classify objects it finds, allowing military robots to identify targets. Lidar is used to detect atmospheric conditions, such as composition, structure, wind speed and shear, and aerosols. Pollution and gases (for example, ozone, carbon dioxide, or water vapor) in the atmosphere can be measured this way. Lidar robots can be deployed to measure air quality in confined, potentially hazardous locations. Lidar is also being used experimentally to map smoke from wildfires, and to estimate fuel availability and density for wildfire modeling. 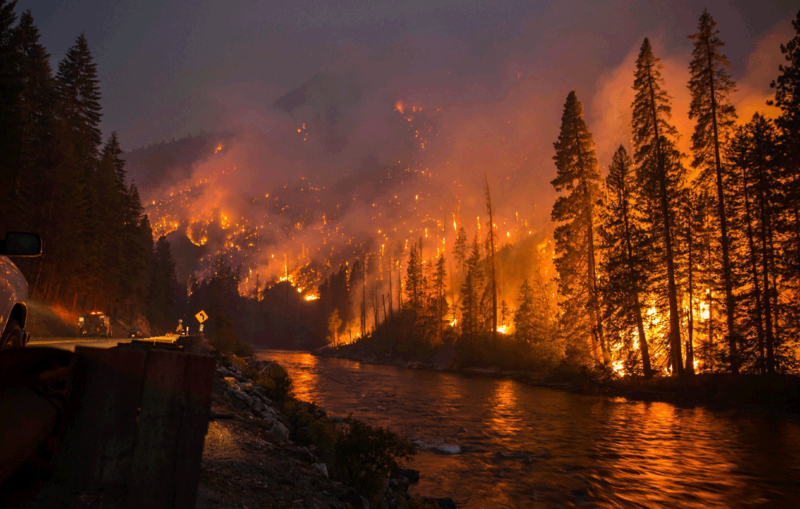 The Chiwaukum Fire, started by lightning, burned more than 14,000 acres in July 2014. Lidar can be used to identify and map streets, highways, railroads, grades, levees, buildings, and other man-made features. Combined with hazard mapping, it allows planners to find the best location to build. Planners can also use the information to calculate line of sight, and identify building height. Areas where cut and fill are needed can be measured with accuracy for road planning. Combined top surface elevation, hillshade, and slope map of the Tacoma Dome, Tacoma, WA. Traditional surveying is very time consuming and labor intensive due to the high amount of accuracy required. With lidar, engineers can use these models to perform analyses of areas without ever setting foot there. For example, they can accurately identify trees growing too close to utilities that need to be cleared. Or a hydroelectric dam can be examined to identify subsidence, perform hydrologic modeling, or look at water levels to ensure continued safety. 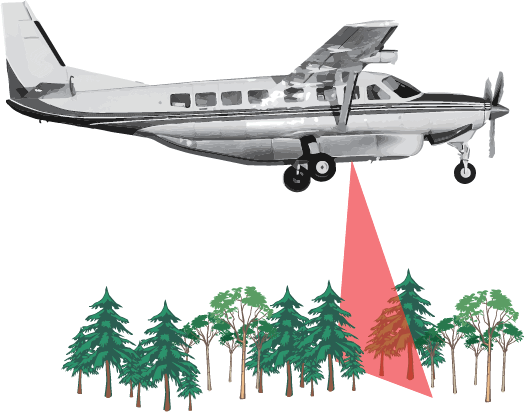 Lidar can be used in the field of archaeology to find things hidden by the forest canopy. Large features that would be indistinguishable on the ground are readily apparent in a lidar survey, leading archaeologists to sites they might not have otherwise found. For example, intensity returns can be used to detect features just below the surface that affect plant growth. Lidar rendering of Stonehenge and surrounding barrows. Lidar can also be used in agriculture to determine slope angle and direction. These factors help to calculate possible crop yield, precisely locate and determine amounts of fertilizer placement to maximize crop yield, and to plan efficient drainage. Lidar can also be used to maintain orchard health: to see where trees need pruning, count trees, or other maintenance needs. Bare earth hillshade and elevation of cropland near Ellensburg, showing southwest drainage, irrigation pipelines, and drainage canals. Orchard land near Entiat showing the tree canopy hillshade and elevation. Lidar images from Washington State. Useful as screensavers or for presentations.